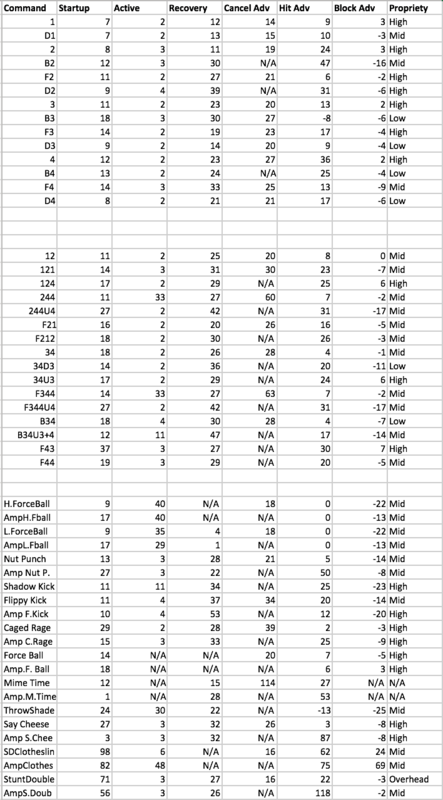 It is interesting to look over the frame data after playing the beta. Can't speak to how he'll actually play, but it does look like Johnny is going to eat a lot of low jabs and upper cuts. Hey everyone out there. Frame data picture made me cry, he is bad xD. Legit all his plusframes strings are duckable plus straight force balls Ex is +3 it's nothing and u can't pressure with it cause his f4 and f3 are 14 frames and b3 is 18 wich is hot garbage. I see some pluses of certation strings or specials, like another force balls wich is -22 on block have 9 frames of start up wich is fast . Also i see potential in Camera combos around of 40% in the corner. 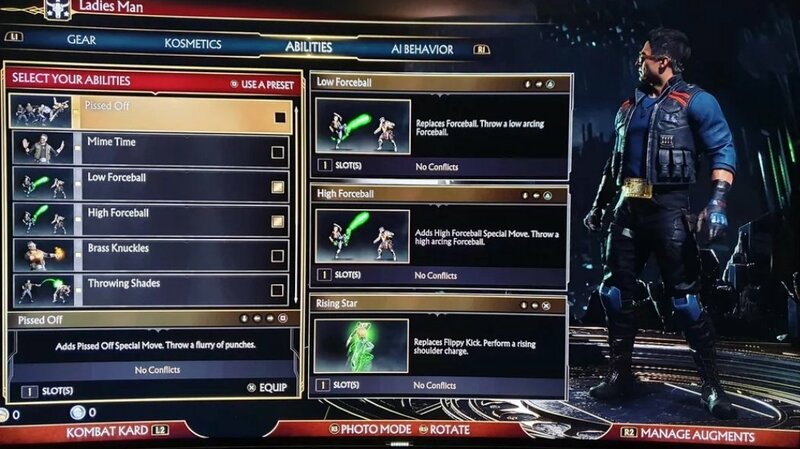 If they will make his f3 a mid that's gonna change everything and also it's should be much faster not 9 frames but around 11-12 ( 11 was in mk x) also some of his basic attacks should be less minus b2 is -16 wtf ? also f2 should be mid with 14 frames of star up. Legit right now he is trash. U can't make a person respect ur highs ( with good plus frames) with out overhead) But it's still a beta frame data. And i will still play him and explore everything before actully making any conclusions. Im still hyped. His MK9 incarnation had no low starters and one overhead (Axe Kick), and he was one of the best in the game. I don't mind taking off that overhead. hell i don't even mind to having no low. but legit all his starters are HIGH. Only b2 and f4 is a mid and b3 is 18 frames low b2 is -16 and also there is no strings after b2. F4 options are limitted. No one will stand and high block against him. Like i said remove low and don't add overhead, BUT make his f3 mid with 12 frames start up and make him more plus after some of his options. Like Kabal have no low or overheads, but he have some overheads in middle or end of his strings. But no low or overheads as a single starting strikes. best thing that could happend to johnny with out changing any frame data. In strings where he has choise to end strings into high and get a plus frames or end in mid and be -2 or -5 that mid should be an overhead. So ppl have to guess will he do overhead and go just safe or he will go for those plus frames. Also some of his enders have huge gaps where u can flawless block punish them. Guys to be clear, im not salty im just saying my opinion. Im still hyped asf for Johnny Cage cause he is my fav. since mk1. And we have to wait 20 more days to check everything by our selfs. So im just saying what i think right now. And i will like to change my opinion on release. Guys to be clear, im not salty im just saying my opinion. 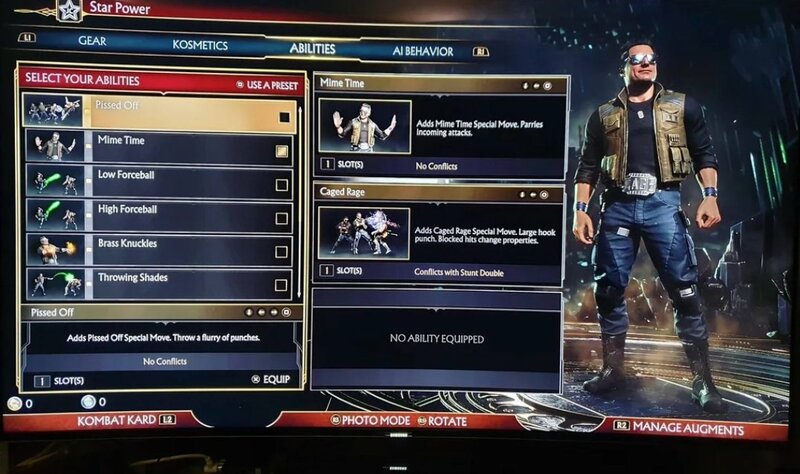 Im still hyped asf for Johnny Cage cause he is my fav. since mk1. And we have to wait 20 more days to check everything by our selfs. So im just saying what i think right now. And will like to change my opinion on release. The frame data in these demo builds is just flat out wrong. Scorpion had cancel data on moves that weren't even cancelable. Don't even use it rn. Besides the Erron Black leak showed that Noob had 4 win poses total so I'm guessing others have 3 or more. I'm not trusting the numbers on those screenies just yet. If those screens came from early in production, the number of unlockable items could have just been an estimate or mock-up (for whatever reason). Don't wanna get my hopes up. But good call on all the VPs we've seen! We have seen 4 poses/ intros for several characters already though. 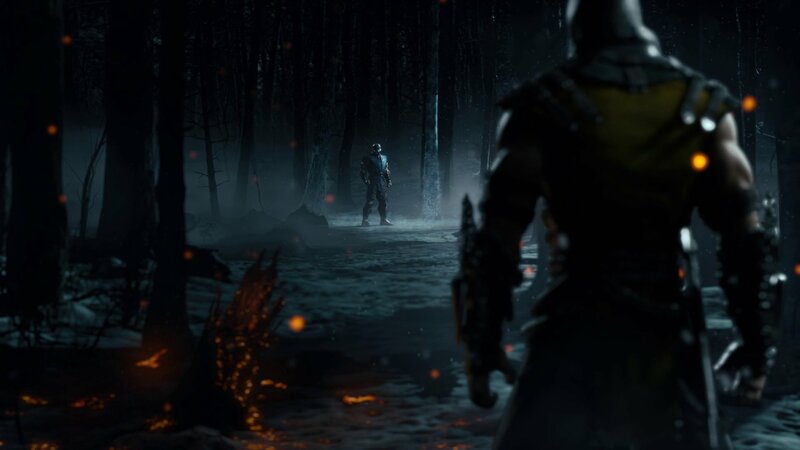 Baraka, Sub-Zero, Scorpion.. I think it is pretty safe to assume everyone will have at least 4 of both on launch. This, although I believe 2 intros and 2 win poses will have to be unlocked for each character. I wouldn't be surprised if some characters had more than others tbh. Closest comparison I could think of for this is in Apex Legends. Some characters have 3 executions and my main dude only has 2. Hopefully though, Johnny's gotten some love in this game and we've got a buncha toys to play with. Yeah, I think there'll definitely be some with more than others. Like Scorpion might end up with 5 or 6 down the line, but I'm pretty sure everyone'll have at least 4 on launch. Man I'm getting real scared that Johnny's gonna take too much skill to be even halfway decent with. Just to be clear, I'm not saying he'll be low tier, I don't have the first clue about competitive balance... but he's all about being in your face without any good, safe-ish tools for getting in your face. Seems like he'll really struggle vs zoners (when played by a scrub like me) and against most other characters it'll still be on him to block perfectly and whiff punish just to create any openings. Kano looks worryingly "fair" too but even then at least he has Kano ball. Or am I reading him all wrong as a character? Cage in MK9 struggled against zoners as well, having really only his EX Shadow Kick to be able to get in safely due to its armor and arguably the worst projectile in the game, and he was still a very solid character. He seems to have pretty much the same game-plan this time around as well, except at least this around he'll have a better projectile with the Straight Fireball. Since there's no longer armor in this game, aside from Fatal Blows, getting in with Cage is gonna pretty much much come down to knowing when to jump over projectiles and to be patient. It reminds me of playing someone like Tracer, Genji, Ana, or Widowmaker in OW, sure they're all insanely strong characters, but only if you're very good. If youre in the bottom 70% of the player base then it can be a very uphill battle trying to make them work. Imagine these Cleo fortune telling tier list predictions before the game is even out. Hey, man. According to every character's subforum, they're bottom tier. I think the first one could have Brass Knuckles (fisticuffs buff), Pissed off (probably a command grab) and Caged Rage (the pressure hook that can be "charged" on block to eventually become an unblockable). It would be a great pressure/mix up variation. The pressure game would be sick with the buffed chip damage, and offer a good guessing game between keeping the chip damage pressure on, the ability to tick throw and using the unblockable mid. The second one could be more focused on combos and damage. Say Cheese seems to be a great combo extender and, combined with Nutpunch MB, it could really allow for big damage combos. I'm not really sure about the second move, I'd say maybe Rising Star that could be a good move to end a combo (and setups with the MB version that hard knocks down) or Throwing Shades to give him an extra zoning option at fullscreen. I think the default load outs will be the ranked options. And if memory serves me correctly, the one loadout that comes to mind had 'Throwing Shade', 'Say Cheese' and whatever that unblockable hook is called. Regardless, I'll be using whatever preset comes with the command throw because imagine getting restood by the nutpunch, then having to worry about getting tick-thrown afterwards. Ooooh I'm gonna have fun with that. So me and @ShepherdOfFire were talking about something over messages and I just realized something about Johnny that is actually really good. I was focused so much on how good his F344 string was because of it's ability to shimmy/whiff punish with, but the true star is his 244 BY FAR. Both of these strings end in the same kicks that could space for a whiff punish, but 244U4 is special in a different way. The startup on the followup for each move is identical to the recovery. This means that at any point, if Johnny is staggering with any part of of this string, the opponent would have to literally guess when Johnny is going to stop attacking. In the frame data, the string startup is the gap between the first move and the move shown. This means that this particular string is stagger pressure GOLD. Sure, at the 244 part he is -2, but the opponent would still have to literally guess if they wanted to counter poke. There is no reacting. 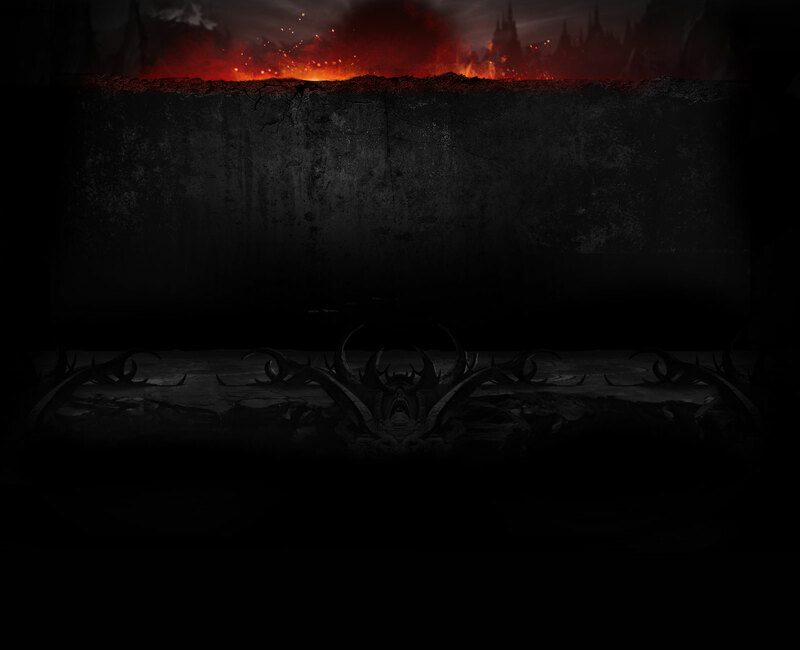 The final hit U4 part is a high that Krushing Blows on counter hit. The opponent will be encouraged to do a crouching poke if they do want to counter poke on a read. 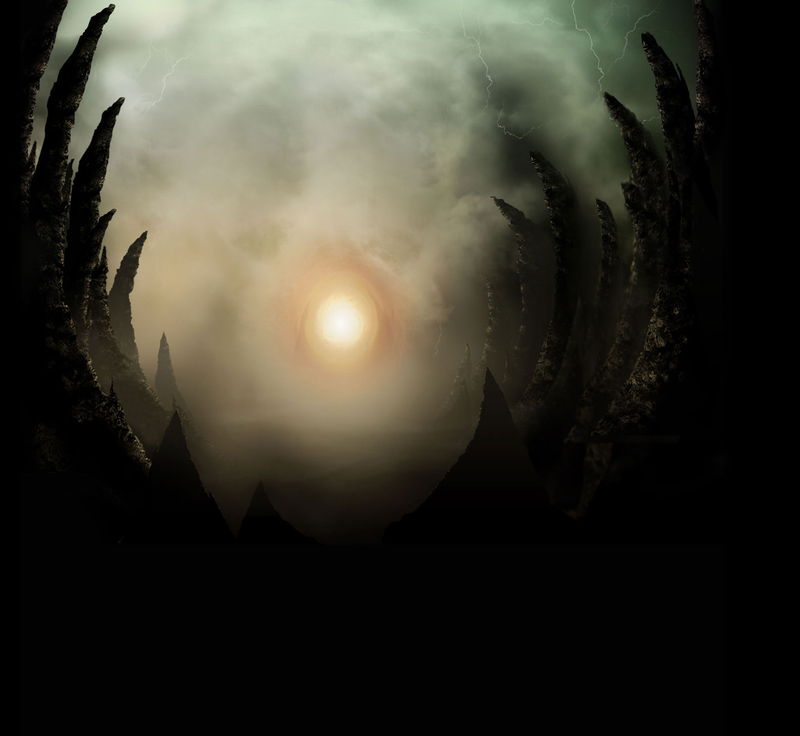 With Johnny Cage's walk speed being so ridiculously fast too, I could see this opening up his other options like his super far reaching low, a walk up grab, F4, or something else wacky. Johnny will for sure not be easy to play, but I think it's cool to see that he'll maintain some of his MKX'like stagger pressure and his +frame pokes, strings, and AmpForceballs. He also has a stupidly fast 14frame projectile that is faster than anything we saw in the beta (and it's safer than anything in the beta too). I think he'll be just fine. I think you're spot on with the Fisticuffs variation. All of those moves seem made for one another. Say Cheese and Nut Punch have the same input BD3 so I doubt we'll see them together. My money is on the 2 Stunt Double abilities and possibly another? So me and @ShepherdOfFire were talking about something over messages and I just realized something about Johnny that is actually really f**king insane lol. Like, MKX-levels of pressure good tbh. You're a top notch TYMer @Circus!! They said that the loadouts in the reveal breakdown weren't the ones we will be using in ranked and tournaments. Johnny will have brand new variations for Ranked/Tournament play. the one loadout that comes to mind had 'Throwing Shade', 'Say Cheese' and whatever that unblockable hook is called. My money is on the 2 Stunt Double abilities and possibly another? Say Cheese and Nut Punch have the same input BD3 so I doubt we'll see them together. Oops forgot about that . Look at the input, really does look like Pissed Off is a command grab.